Our 2017 Tulane Emerging Scholars were environmental scientists on the move! They engaged in numerous field experiences and conducted individual research projects with the support and mentorship of faculty advisors and graduate student mentors. Each and every experience was unique and engaging for our scholars. 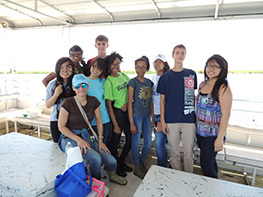 They participated in field trips to Turtle Cove Enviromental Research Station, NASA, Port Fourchon/Harvey Gulf Marine, LUMCON, Chevron Oronite, and the New Orleans Mosquito, Termite, & Rodent Control Board. They also participated in a four hour canoe trip hosted by Dr. David White and Canoe & Trail, where they were immersed in Louisiana swamps and marsh land in real-time. Each of the scholars completed an environmental health science research project with their mentor and faculty advisors, and presented their research in an interactive poster session on the last day of the program. The 2017 scholars were Nameera Islam, Alma Adoue, Taylor Miller, Alicia Clark, Alexandra Maag, Ricardo Salas, Arden LeBlanc and Jermaine Hill. The Tulane School of Public Health & Tropical Medicine and the faculty, staff, and mentors of the Global Environmental Health Sciences Department are very proud of your accomplishments and participation this summer. 2018 Emerging Scholars Complete a Awesome Summer in the Lab and Field! The 2018 Emerging Scholars completed a successful eight weeks in the laboratories and in field. They participated in environmental health science rotations focusing on toxicology, epidemiology, and disaster management. In week three they started their individual research projects in Tulane Global Environmental Health Science laboratories. Additionally, the scholars participated in numerous field experiences focusing on the impact environmental factors have on health. Some of the field experiences were trips to Turtle Cover ERS, LUMCON, and Chevron Oronite. Congrats to our 2018 Emerging Scholars! 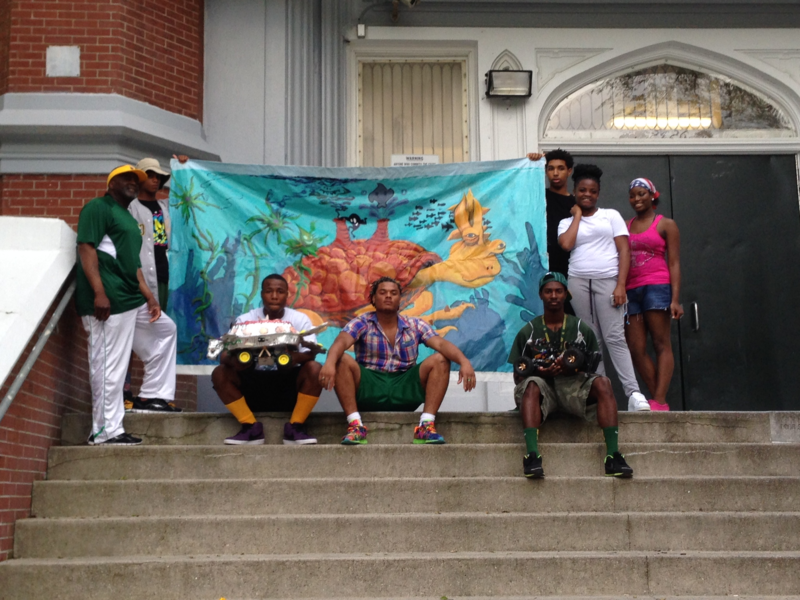 Nine high school students from Southeast Louisiana public/charter/magnet schools participated in the Tulane Emerging Scholars Environmental Health Sciences Academy in summer 2016. Each student was assigned a mentor and faculty advisor to facilitate their completion of an environmental health science research project. 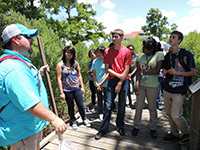 The students also participated in six environmental health science field experiences to places such as: Turtle Cove ERS, NASA, Chevron Oronite, Port Fouchon, Harvey Gulf Marine, and New Orleans Mosquito, Termite and Rodent Control Board. The scholars were honored at an awards ceremony and poster session held at Tulane's School of Public Health and Tropical Medicine, where they received an award of $2000 for their successful completion of the program. Congratulations to our 2016 Tulane Emerging Scholars! The Tulane Emerging Scholars Environmental Health Sciences Academy had four scholars to participate in the 2016 Society of Toxicology Conference held in New Orleans at the Morial Convention Center. Hana Alkhafaf, Teyonn Ennis, Jessica Ding, and Siddesh Ponnapakkam presented EHS research projects they conducted in the Academy in a series of poster sessions. They did an exceptional job explaining their projects to a vast audience of toxicologists from across the USA and around the world. The Tulane Global Environmental Health Sciences faculty, staff, and the Emerging Scholars EHS Academy applaud them for their great work! 2015 Emerging Scholar Jonathan Cuccia participated in a poster session at the Gulf of Mexico Oil Spill & Ecosystem Science Conference in Tampa, Florida in early February 2016. 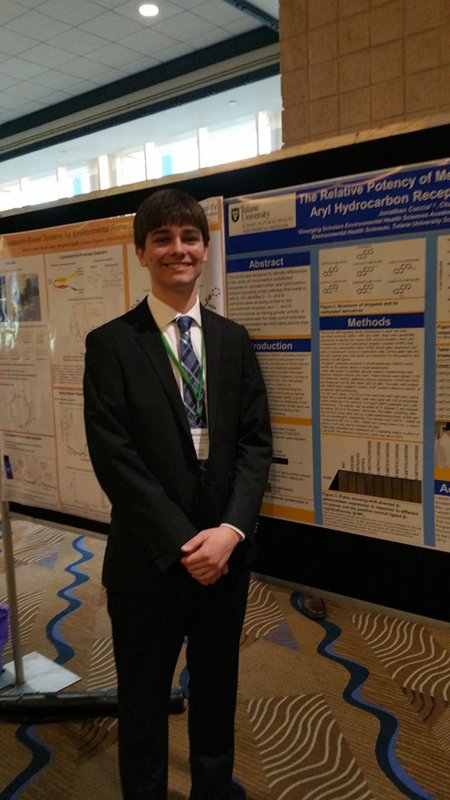 At the conference, he presented his poster for his individual research project entitled, "The Relative Potency of Methylated Chrysenes in Aryl Hydrocarbon Receptor (AhR) Activation." Jonathan worked on his project with mentorship from GEHS faculty member Dr. Charles Miller. The 2015 Emerging Scholars completed a successful eight weeks in the laboratories and in field. They participated in environmental health science rotations focusing on toxicology, epidemiology, industrial hygiene, and disaster management. In week three they started their individual research projects in Tulane Global Environmental Health Science laboratories. Additionally, the scholars participated in numerous field experiences focusing on the impact environmental factors have on health. Some of the field experiences were trips to Port Fourchon, Turtle Cover ERS, and the Vietnamese community. Congrats to our 2015 Emerging Scholars! Scholars participated in a field trip to Turtle Cove Environmental Research Station and the Hammond Assimilation Wetlands in Manchac, Louisiana. At the Wetlands, hosted by Dr. Gary Shaffer, the scholars planted cypress trees in the marsh and learned about the importance of preserving our coast to facilitate environmental and public health. Right up the road from the Wetlands, at Turtle Cove ERS, hosted by Dr. Robert Moreau, they engaged in activities and discussions addressing the historical impacts on the environment and public health in Louisiana. The 2014 Tulane Emerging Scholars were the first to ever tour a deep sea ship, courtesy of the Lafourche Parish Port Commission (Port Fourchon) and Harvey Gulf Marine. The scholars got to tour the entire ship to address its functions and environmental practices instituted by Port Fourchon and Harvey Gulf to assure environmental quality and sustainability. One of the most exciting components of the field trip was going to the ship's bridge and meeting with Captain Tommy. The Captain's demonstration of ship functions was exciting and a learning experience for the scholars, as well as for Tulane faculty and staff. Thank you Port Fourchon and Harrvey Gulf for an exceptional field trip! Tulane University Emerging Scholars Program Director, Lynette Perrault and PhD Candidate, Diana Hamer, partnered with John McDonogh High School in developing a GIS Mapping Project for the C-STEM Competition in Houston, Texas. Science Teachers and Science Club Directors, Donald Moore and Richard Stall, led their science club students in the competition where they placed 2nd in the GEO Science Division and 4th in the Sculpture Division. Congratulations to John McDonogh Science Club 2014! As we embark on year two of the Emerging Scholars EHS Academy we have had a tremendous outpouring of motivated high school juniors and seniors from Southeast Louisiana public /charter /magnet high schools that applied to our Academy. Even though we would like to accept all applicants, we are only able to accept nine scholars. Upon extensive review the following 2014 Emerging Scholars have been selected, Rodney Carey, Jr.,McMain H.S., Ahmad Abughazleh, Haynes Academy, Gabrielle Maldonado, Chalmette H. S., Yasmin Eriksson, Ben Franklin H. S., Terrill Dew, Joseph S. Clark H. S., Adam Strickland, Haynes Academy, Dao-Joanna Nguyen, McMain H. S., David Girgis, Helen Cox H. S., and Chengjia Yu, East Jefferson H.S. Congratulations to our 2014 Emerging Scholars! We would like to thank each and every student applicant for their excellent applications, their interest in our Academy, and their commitment to science literacy and research. Good Luck to each and everyone of you! The 2014 Academy is scheduled for June 2nd through July 25th, 2014. 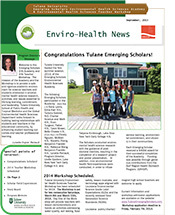 The Tulane University Environmental Health Sciences Teacher Workshop was a complete success this Spring, 2014! We hosted 10 science teachers from Orleans, Plaquemines, St. Bernard, and Jefferson Parish Public/charter/magnet high schools for two consecutive Saturdays, March 8th and March 15th, 2014. Day One of the Workshop provided science teachers with lesson demonstrations and hands on activities addressing water, soil, and food quality, along with an air quality and mercury in fish technology based lesson modules aligned with Louisiana Environmental Science Grade Level Expectations, common core, and the recently released Next Generation Science Standards. Day Two of the Workshop offered a full day of EHS field experiences to the Hammond Assimilation Wetlands, where teachers planted over 100 cypress trees, as well as a visit to Turtle Cove Environmental Research Station. This was the first time science teachers had ever gone to the Hammond Assimilation Wetlands site and we look forward to building a lasting and ongoing relationship with the facilities in Manchac, Louisiana. The overall goal of the EHS Teacher Workshop is to facilitate EHS professional literacy, awareness and leadership capacity in their schools and communities. (Back Row L-R) Sena Lyons, Edna Karr H.S., Tariona Gabriel, N.O. Charter Science and Math H.S., Evan Turgeon, Fisher H.S., Tyson Moser, Belle Chasse H.S., (Front Row L-R) Christy Nguyen, McMain H.S., Xiaoshu Zheng, Benjamin Franklin H.S., Rebecca Wang, Benjamin Franklin H.S., Lynette Perrault, Program Director, Lirelle Gardere, Lake Area New Tech Early College H.S. and. Tatyana Kimbrough, Lake Area New Tech Early College H.S. The Scholars conducted environmental health science research with the guidance of postdoctoral mentors and faculty, resulting in the completion of a research project and poster presentation. In order to infuse environmental health service learning, awareness, citizenry, and leadership empowerment in their communities, the scholars also participated in nine environmental health field experiences they could relate to their communities and lives. Each Emerging Scholar received a $4000 award for their successful completion of the Academy. Funding was possible through generous contributions from the Gulf Region Health Outreach Program. (GRHOP). The Emerging Scholars participated in several field experiences in the summer session, 2013. Student learning outcomes and service learning in environmental health sciences was the focus. Through their participation, scholars were better able to apply new and current environmental health knowledge to real world issues they experienced in the field. 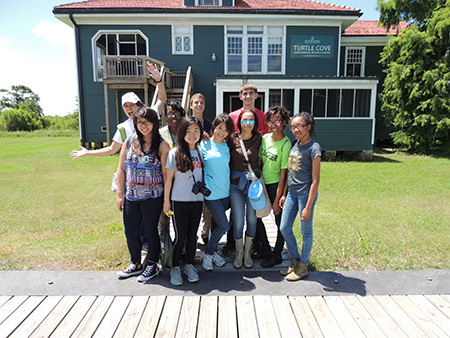 Students participated in a field experience at the Turtle Cove Research Station, in Manchac, Louisiana, where they learned the extensive history of Louisiana coastal erosion and restoration projects. Additionally, hands on experiments in water quality facilitated relevant connections between data and real time results. 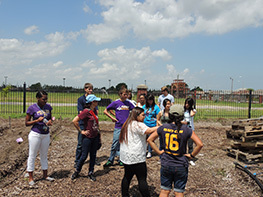 Scholars were charged with embracing nature in the Vietnamese Community in Eastern New Orleans, through their work in the urban garden. Through a service learning project, students planted seedlings as a part of an agricultural outreach project in the community.